Extraña Invasión (1965) - Sci-fi-central.com. Argentina  1965  85m   Directed by: Emilio Vieyra. 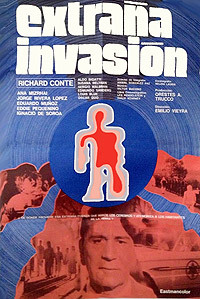  Starring: Richard Conte, Jorge Rivera López, Eddie Pequenino, Eduardo Muñoz, Anna Strasberg, Ignacio de Soroa, Sergio Vandes, Edmundo Sanders, Susana Beltrán, Emilio Vieyra, Monica Mihanovich.  Music by: Víctor Buchino. A strange psychedelic signal invades the TV screen and turns children and old people into hypnotized junkies in front of it. Although I certainly enjoy seeking out obscure pre-1970 scifi and horror films, "Estrana Invasion" was a particularly tough slog to sit through. In fact, the only special effect of the film is a TV screen that broadcasts a wavy lined image which hypnotizes children and older people. Even worse were repetitive scenes of listless quasi-zombiefied children breaking into their neighbors homes to watch their TVs. Meanwhile, the dull dialogue, amateur acting, mundane sets and cinematography, meander into an absolutely bewildering conclusion that involves souped up swamp gas, germanium. and a crazed electrician who vows to control and destroy everyone at will! However, I did find some amusement viewing an Argentine film with a predominately Spanish speaking cast, that purports to be set in the US. For instance, in my subtitled DVD-R, American actor Richard Conte is constantly addressed as "Intendent" and "Washington officials" are constantly berated by the irritated town folks. Although, this film released to the US in 1974, it had been sitting in the can since 1965. Watch and see why its release had been delayed for so long. Review by marthahunter from the Internet Movie Database.